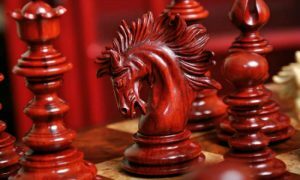 Find a beautiful and high-quality natural stone chess set, at an affordable price, using this buyer’s guide. Chess sets carved from marble and other types of natural stone are some of the most luxurious sets available in 2019. They’ve also been a marker of luxury throughout history. It’s no surprise why any discerning chess enthusiast would want to own one of these beautiful sets, though there are a few things to consider before you pull the trigger and buy one. 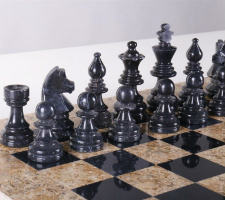 There are many different types of natural stone that can be carved into a luxury chess set. Just a few of the most popular options are marble, granite, alabaster, onyx, jade and soapstone. Each of these materials has its own unique look and feel to it, though there are usually considerable color variations between stones, even those of the same type, which brings us to our next consideration; color. There is usually a certain type of coloration that comes to mind when one thinks of a certain type of stone. For example, marble is usually white and grey, while onyx usually has a signature black color. However, some stones like granite can have a great deal of color variation between slabs, so you can practically choose any color combination you prefer. Sometimes there are even ways to alter the natural appearance of the stone, but not for every type of stone. 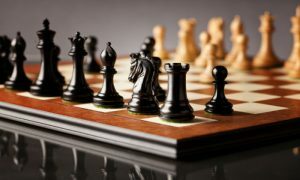 These are all things that you’ll need to consider when choosing a stone chess set. If you have your heart set on an onyx chess set, but you’d really like a bright blue colored board, something will have to give. Of course, the last thing you will need to consider is the price of the stone chess set – not that you should put this category off until last! We recommend exploring what budget range you’re comfortable with first, before doing anything else or looking at any chess sets. This will help narrow down your search and will likely inform your choices about what material you’d like to look for. Most importantly, it will prevent you from getting your heart set on marble or stone chess sets that are well outside of your comfortable price range. Avoiding this one common pitfall will help you be more satisfied with whatever choice you end up making. 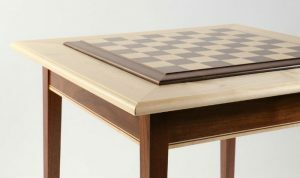 This is a compact alabaster chess set that won’t take up too much space in a smaller living room or office, but it will still command just as much attention as a larger set! The board and pieces are made from natural Italian alabaster stone that has been polished to a smooth, shiny finish. 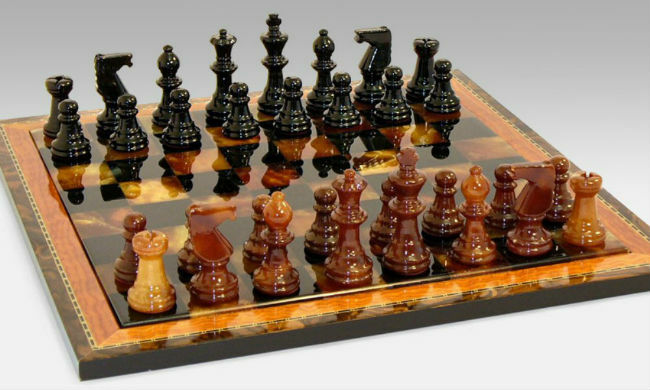 The chessboard also has a wooden frame around its outside perimeter which is a unique touch that sets The Black & Brown Alabaster Chess Set apart from other stone chess sets. This alabaster chess set is available in 6 different colorways, including black and brown, black and white, blue and white, black and red, green and white, and brown and white. Alabaster is one of those materials that has a signature color to it but can also be customized and dyed to fit your preference. It’s not an exact science, and because of the different way each piece of natural stone takes the dye, colors can’t be exactly reproduced, and no two sets are exactly alike. 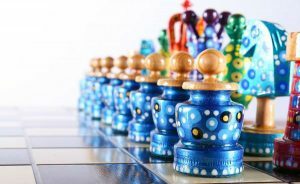 The uniqueness and customization options available make this alabaster chess set a great choice for people who feel strongly about having a certain color for their set while still maintaining a unique, handcrafted look. The chess pieces included with this set are individual works of art themselves. Their smooth, clean lines are enhanced by the smooth shiny finish of the polished alabaster. 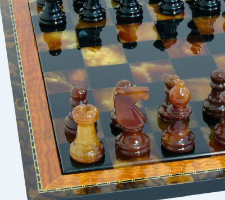 In the black & brown alabaster chess set, the brown pieces are a light, glossy brown, while the black pieces are deep, dark, and slightly translucent black. The contrast is striking and very pleasing to the eye. This alabaster stone chess set is a high end luxury product that has been crafted from the finest of materials. Surprisingly, it also comes at a relatively affordable price. It’s not often that you’re able to get a top shelf quality product at a rock bottom price, so this set is a great deal and offers an unbeatable value for the money. 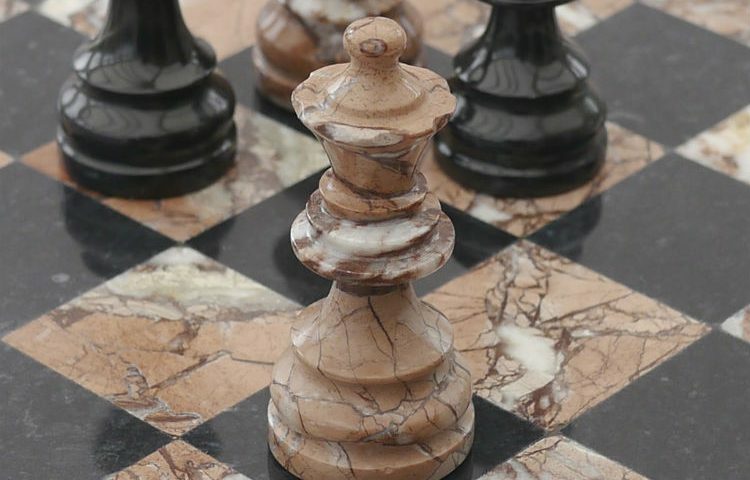 This set is one of the most beautiful marble chess sets for sale in 2019 due to its natural, fossilized stone coloration. The natural veining and swirls present in natural marble mean that no two of these sets are the same. Each product is completely individual, though they are all beautiful. The marble chess board included in This Coral & Black Marble Chess Set is a work of art in its own right. It is primarily made from the coral colored marble, with plenty of swirling veins throughout. Black marble is inlaid in the coral stone to make the traditional checkered board pattern. The chessboard is weighty from its solid stone construction and provides a firm foundation for gameplay. It is 16 inches square in all and the squares are each 1 ⅝” giving you plenty of room to play without taking up a lot of space in your room. 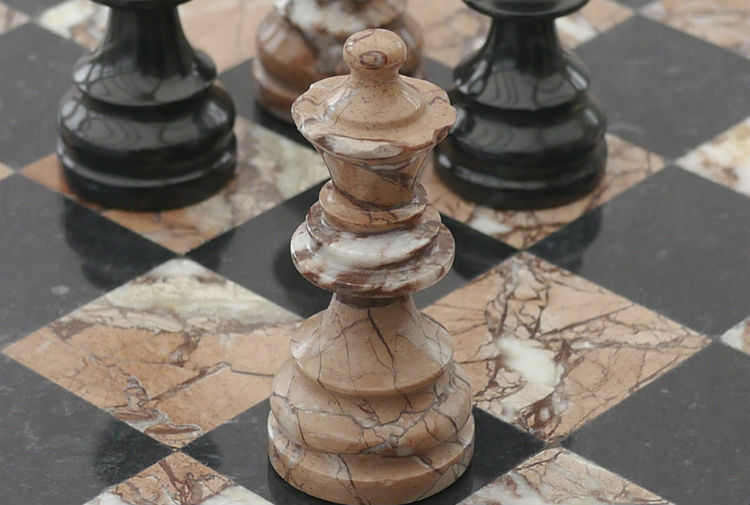 The chess pieces in this marble chess set are every bit as finely crafted as the board. The chessmen are closely modeled after the traditional Staunton pattern, which is rare among marble chess pieces, which are usually more modern in design. White’s pieces feature more of the beautiful coral colored marble while Black’s pieces are dark black marble with natural veins of silvery grey throughout to keep things interesting. Nothing about this marble chess set is one dimensional. Down to the last detail, this is a marble chess board set for the traditional chess player looking for the luxury of a natural stone chess set. With this set, you don’t have to compromise on your style to get what you want. Best of all, the coral & black marble chess set comes complete with a custom made chess box in which to store all your marble pieces when they’re not in use. Each piece has its own padded bay within the chess box so that they don’t smack into each other and become damaged. At first glance, this marble chess set adheres more to the traditional coloration expected from marble – white and grey. But, when you look again, you’ll notice that Black’s pieces actually have a hint of green to them! 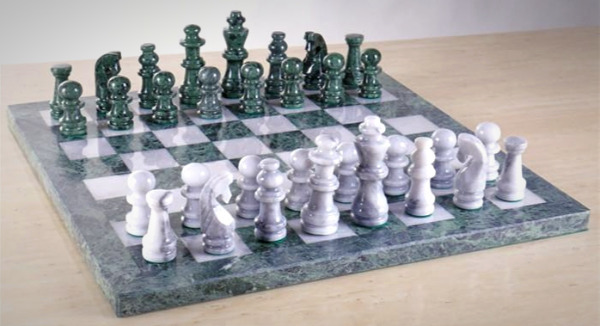 Yes, this hand carved marble chess set actually consists of two different types of marble – the traditional white and grey and a more unexpected green and black. It’s not a color that most people are used to seeing on such a set, but once they see it everyone is struck by how gorgeous it looks! Your friends will be equally impressed when they come over to play a game with you. 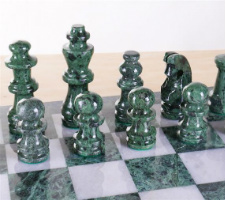 The unique coloration of The Green & White Marble Chess Set, along with its high quality craftsmanship and gorgeous looks, is what landed it this place on our list. The marble chess board is crafted from the same high quality materials as the rest of the set. It features a finely polished green marble frame inlaid with squares of milky white marble with grey veining. On the underside, the beautiful marble chessboard is covered in protective green felt to ensure that your surfaces and furniture are not scratched or damaged by the stone. 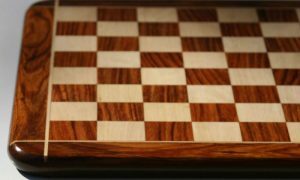 It is 16 inches square in total with 1 ¾ inch squares that perfectly accommodate the chess pieces. This set’s chessmen are crafted of matching green and white marble, also honed and polished to a smooth and shiny finish. Each piece is footed in thick green billiard cloth to dampen sound and prevent the pieces from scratching the chessboard, which would ruin the beauty of the natural stone. This is the most compact chess set on our list, but it still packs a punch! This beautiful natural onyx chess set may not look like what first comes to mind when you think of onyx chess sets, but it’s a breath of fresh air. Rather than stark black, this onyx chess set features a rainbow of gorgeous, swirling colors that run throughout the board and chess pieces. 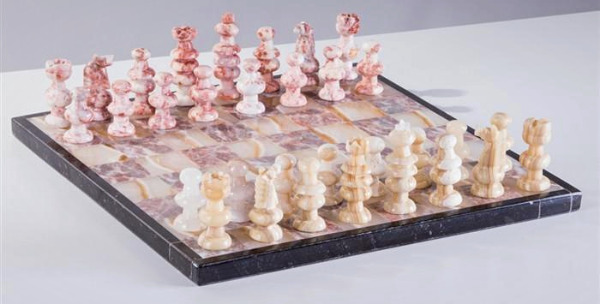 Though the stone is polished to a shiny finish, it maintains a lot of its raw look and feel, making The Pink & Swirled White Onyx Chess Set a joy to play with for anyone who appreciates natural stone. The chessboard of this onyx chess set is hand hewn from solid Mexican onyx stone. The craftsmen who carve them have decades of experience in working with raw stone and turning it into something beautiful and one of a kind. 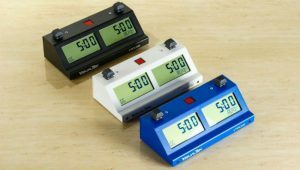 The compact board is only 13 ¼ inches square, so it can fit into almost every corner or cubby. By eliminating the large border that some other chess boards have, though, it is able to accommodate 1 ½ inch squares, which is larger than many of the other, bigger boards on this list. 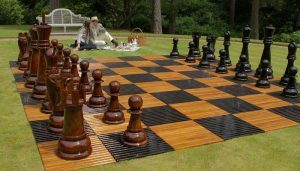 The larger square size makes for more comfortable play and allows the board to work well with larger chess pieces. Speaking of chess pieces, the stunning, hand carved onyx chess pieces that come with this set really need to be seen to be believed. Sure, they look good in photos, but there is something about the beauty of seeing the variations of the stone in person that can’t be captured on camera. Each of these onyx chess pieces are 100% hand carved, they have never even been near a mold. Because of the handmade nature of the item, some variations both in color and shape or size are to be expected when purchasing this onyx chess set. With a whole world of natural stone chess sets to choose from, it can be difficult to know where to begin. How can you choose the most beautiful type of stone, let alone the most beautiful chess set ever made from that type of stone? Our advice is not to worry so much about finding the one perfect natural stone chess set, but instead keep an open mind and see what speaks to you as you are looking through listings. Don’t pigeon yourself into looking for only one type of stone or one certain color, because you might miss a lot of great stuff that way. For example, if you were dead set on finding something green, you may have overlooked the green marble set featured on our list, since marble is not typically green. That would be such a shame! It’s good to have an idea of the types of stones you like and prefer, but don’t focus in on them so hard that you’re not open to other nice chess sets made from other types of natural stone. If there’s a time to be stubborn and closed-minded, it’s surely when it comes to your budgetary limitations. We want you to keep an open mind when it comes to material, but not so much with price. Some things we just can’t change. Once you have really crunched the numbers and determined exactly how much you’re able to afford, stick to that number no matter what! It’s tempting to blow the budget on a gorgeous set that’s way out of your price range, but don’t do it. Beautiful, high quality natural stone chess sets can be found in almost any price range, and with a little patience, the right one will come around eventually. 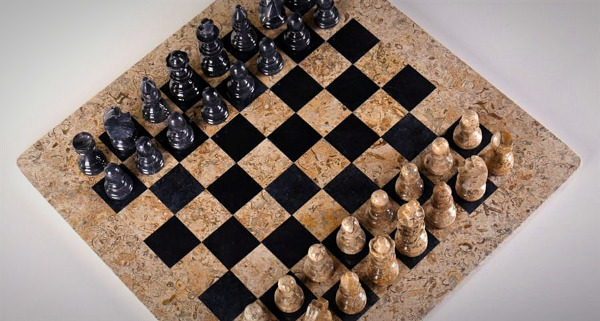 It can be thrilling to track down the perfect natural stone chess set for your home, especially once you finally find the right one after hours of searching. It’s still just as satisfying when you find the right one after only minutes of searching though, too. Do yourself a favor and browse the products we’ve reviewed in this list first. Chances are, you’ll find something perfect was right there under your nose the whole time! Shot Glass Chess: Shot Glass Chess Set – Your New Favorite Drinking Game!